Before you begin Online Stock Trading in the Stock Market, it's necessary you understand the different types of stocks classifications. And the categories they fit in, depends on the company's size, age, business, or it's sensitivity to economic, monetary, and market conditions. A stocks share price move at any given time, may have little to do with what's going on with the company itself. Rather, investors may be reacting to something like falling interest rates or a deteriorating economy that can affect different stock groups differently. A company's earnings and growth prospects are the prime factors in a stock's long term performance. But short term performance often rests as much with the stock industry or stock sector it resides in, as it does with the company itself. It's important to understand how each of these category of stocks performs at various stages of the economic cycle. This is known as group rotation. It is also important to understand that the stock market cycle is not the same as the economic cycle. In fact, the stock market is a leading economic indicator...it anticipates recoveries, and at times will turn up when coincident economic data are still pointing down. In real life, group rotation does not happen neatly and in an orderly fashion. Different stocks in different stock industries and sectors, will spring to life at different points for any number of reasons. But good stock picking combined with awareness of group behavior should narrow the odds in the stock investor's favor. 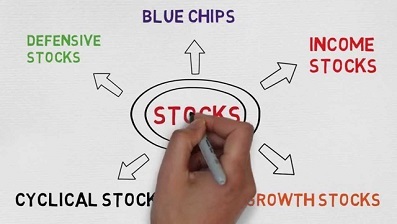 Return from "Online Stock Trading Types of Stocks" to the Home Page: "Stock Market For Beginners"